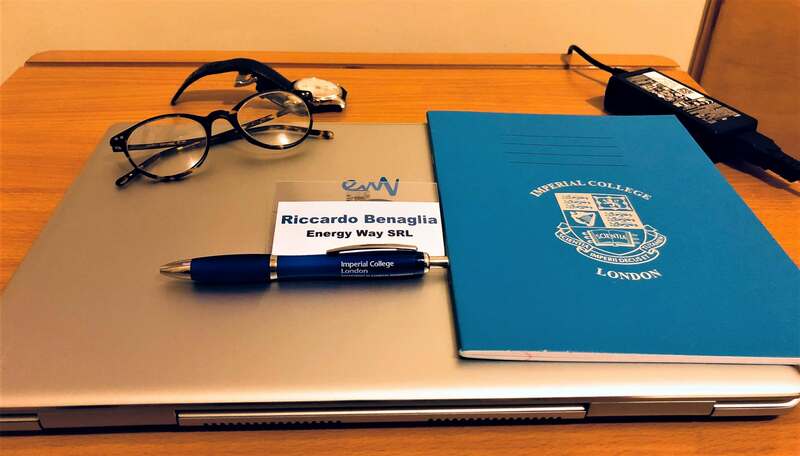 I was very lucky to get the chance to attend a prestigious Summer School held at the exclusive Imperial College in London. The CPSE Summer School 2018, at its first edition, is dedicated to an interesting and at same time debated topic: Optimization under uncertainty. I found this topic extremely stimulant, as it is strongly linked to my graduation thesis in Energy Way. After arriving in London, I spent the first hours of Monday evening hanging around streets and parks, waiting for the Summer School kick off event held at 6 pm. I admit I was a little nervous, but at the same time I could not wait to get involved, meet people and learn a lot. I arrived at the hotel wearing a shirt, my faithful Clarks and I soon left for the University, trying to imagine the frame of the Imperial College in my mind. My predictions were not so bad: at 170 Queen’s Gate I found an environment that I can’t avoid calling british. Welcomed by the Imperial staff, I was introduced into a garden, where Wolfram Wiesemann, one of the organizers, opened the event with a brief introduction to the course. Ready to throw myself into the fray to get to know other participants, I started off the evening with a glass of wine and a beer and I met very interesting graduate students: Andres, an Ecuadorian boy who is doing a PhD at UCL, Gyula, PhD student at the University of Pannonia (Hungary), Jack and Aris, both PhD students in Edinburgh, Pedro and Jude, two doctoral students at UCL. We talked about our areas of research and work and they were somewhat amazed by the fact that I am not a doctoral student (I was the only company-employed attendant at the Summer School). At the end of the evening, we decided to go for a drink in the University’s pub and then say goodbye, excited by the 10 hours of lessons that awaiting us on the following day. I woke up at 7:30 am to the taste of an “English breakfast” made of eggs and beans: the perfect ingredients to start the day to the fullest. Lessons were starting at 9 am, at the Department of Chemistry & Engineering of the Imperial College. Upon arriving in the classroom, I met the guys known yesterday at the host dinner and together we looked forward to the lecture held by Ali Mesbah, Assistant Professor at the Berkeley University of California. Here we are, the CPSE Summer School 2018 officially begun! Different emotions flowed in me, as Professor Mesbah began his lesson. The overwhelming emotion, however, was the nostalgia for the academic world that I have now abandoned for a year! In 3 hours, Mesbah reviewed complex topics: the Polynomial Chaos Method, used for the analysis, estimation and control of nonlinear systems dependent on probabilistic uncertainties, and the arbitrary Polynomial Chaos method, used for multivariate problems in which the stochastic parameters are correlated with each other or have temporal dependencies. At lunchtime I, Gyula, Andre, Jude and Pedro, headed for the market. Among different street-food stands we decided to try the Spanish one and bought a pan of paella each. Good choice! 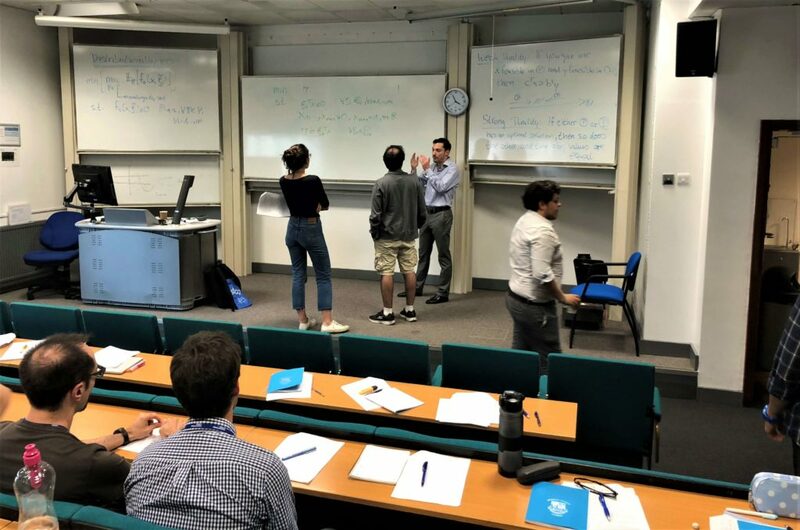 After the usual coffee that followed my every meal, lessons resume with the “lecture” held by Professor Panos Parpas, who introduced us the concepts of Stochastic Optimization and Dynamic Optimization. I got very interested in the latter, as it is used for the resolution of problems related to the use of deep neural networks for chess, Go and other games (in general they concern the optimization of the moves to be made for reaching the highest probability of victory). I left my first day of lessons stunned by the amount of information received in just a few hours. During a half hour-long walk through the spooky Hyde Park, I got the chance to slow down and reflect on the day just passed. And today is the MPC day! Can’t wait for it! Stay tuned and good night. At the dawn of the 3rd day of the Summer School, another interesting round of lessons awaited me. In the afternoon a lecture by Wolfram Wiesemann is scheduled, although the 1st speaker of the day will be Alexander Mitsos, a professor at RWTH Aachen University and director of the Process System Engineering Laboratory at the same university. Mitsos immersed us in 3 hours of engaging lecture focused on Hierarchical (or Embedded) Programs. Thanks to this lesson, we were introduced to the concept of Bilevel Optimization (where a lower level problem is embedded in another higher level one, so that the two problems present a hierarchical structure). Professor Mitsos also illustrated the methods for solving this type of problem, showing us which algorithms can be implemented for this purpose. After a well-deserved break at the university canteen, with classic Fish and Chips, we prepared for the lesson of Professor Wolfram Wiesemann, starting at 2.30 pm. Wolfram accompanied us in the world of Robust Optimization, which does not need a probabilistic description of uncertainty (as required in Sthocastic Optimization), but rather the definition of a set of uncertain parameters. An optimization process is therefore described by a cost function obtained considering the worst case among all the uncertainties. At the end of the lessons, we headed towards an evening made of sociality and international food inside a Georgian Restaurant! The fourth and last day was mostly linked to predictive control. Morning lessons were held by Boris Houska, a professor at the School of Information Science and Technology at ShanghaiTech University. Houska talked about Model Predictive Control comparing the methodology of the trees-scenario with that of the Tube MPC based on set-propagation methods. In the afternoon, we attended the lecture held by one of the world’s gurus of predictive control, Efstratios N. Pistikopoulos, creator of Multi-Parametric Optimization and Control. Instead of relying on an expensive “online resolution” of the optimal problems determined by predictive control, this approach searches for a single “offline solution” over the entire parameter space that defines the system’s input. Professor Pistikopoulos, with an almost commercial approach, tried to convince us of the potential of Multi-Parametric Optimization, showing us all the advantages deriving from it, the possible fields of application and making tangible examples. The end of this lecture also marked the conclusion of the Summer School. I reluctantly bid farewell to my travel companions, promising to meet again in the future, perhaps in another Summer School. Loaded with new notions of the world Optimization under uncertainties, I returned to Italy enriched by this beautiful experience, teasing my imagination for future projects within the Energy Way team. With the contribution of Jona Hasaramaj, Marketing & Communication Office at Energy Way srl.